I love going to supermarkets and spending time walking down every aisle. I never thought I’d say this because I’ve never enjoyed shopping. However, I’ve realised that it’s a great way to make a new country feel like home. Food is a universal connection point between people and an important aspect of every country’s culture. That’s why I think it’s important to know what people eat here and how it is prepared or presented. Fortunately not everything has been foreign and eating Dutch food and treats brings back many beautiful memories from my childhood. I grew up in a Dutch home (my father was born and raised in South Holland before moving to South Africa in his early twenties) and my parents took great care to introduce my sister and I to Dutch food from a young age. When I go to a store I always take a tas or tasje (This seems to be the word people use around here for a shopping bag). I like this part of the experience because I’ve built up an awesome collection of bags. 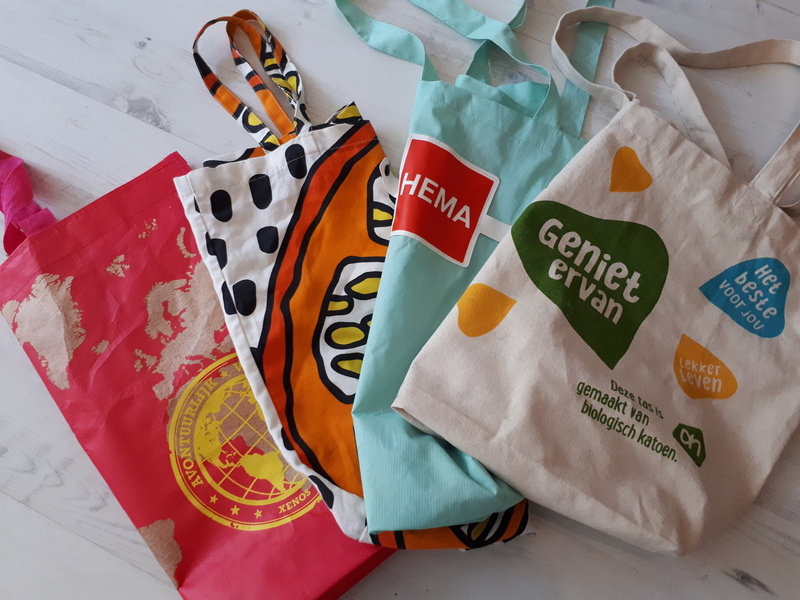 I have my favourite cloth bags but most of them are made from waterproof material (these come in really handy in this climate). 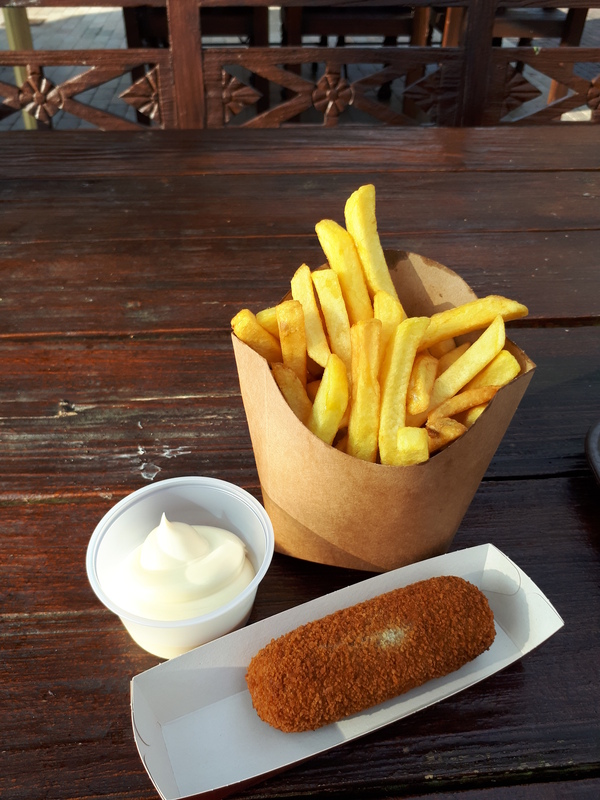 It’s been great fun to introduce my husband and son to some of the yummiest Dutch food. 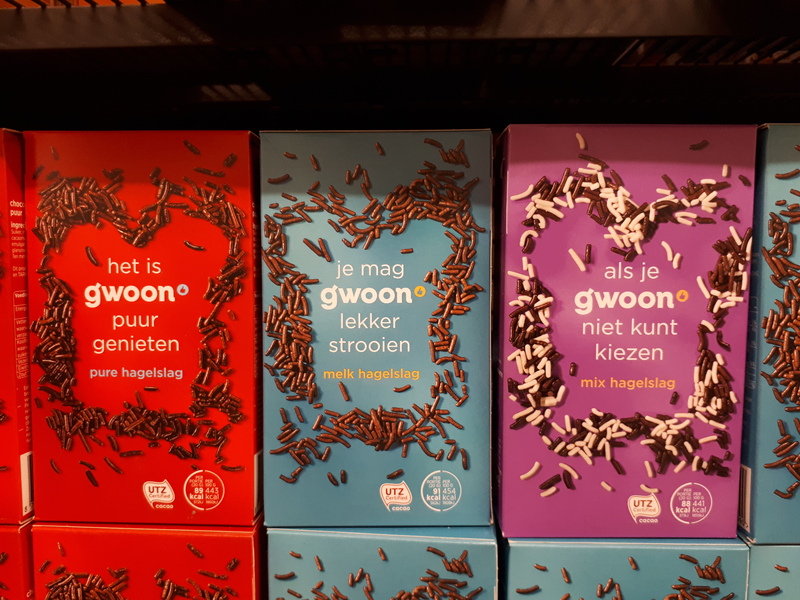 Hagelslag chocolate sprinkles. This can be enjoyed on buttered bread at any time of the day. I’ve also discovered that the sprinkles can be used to jazz up a home-baked banana loaf or mixed into plain greek yoghurt. Stroopwafels. A syrup waffle is one of the best things that will ever pass your lips. They are sold in packets of 10 or so and it is impossible to only have one at a time. My husband and I enjoy having them with coffee or red wine. The filling consists of syrup, caramel, brown sugar and cinnamon. 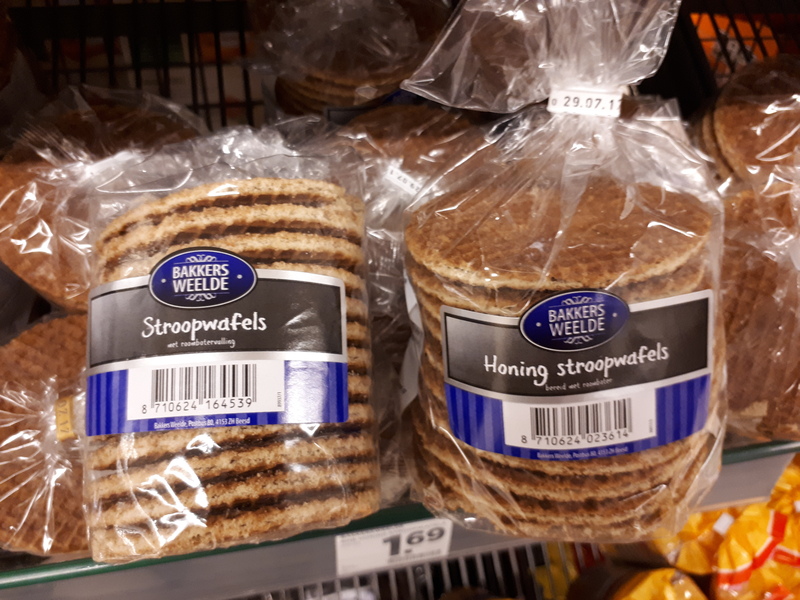 Apparently the stroopwafel was first made in Gouda during the late 18th century or early 19th century by a baker using leftovers from the bakery such as breadcrumbs, which were sweetened with syrup. 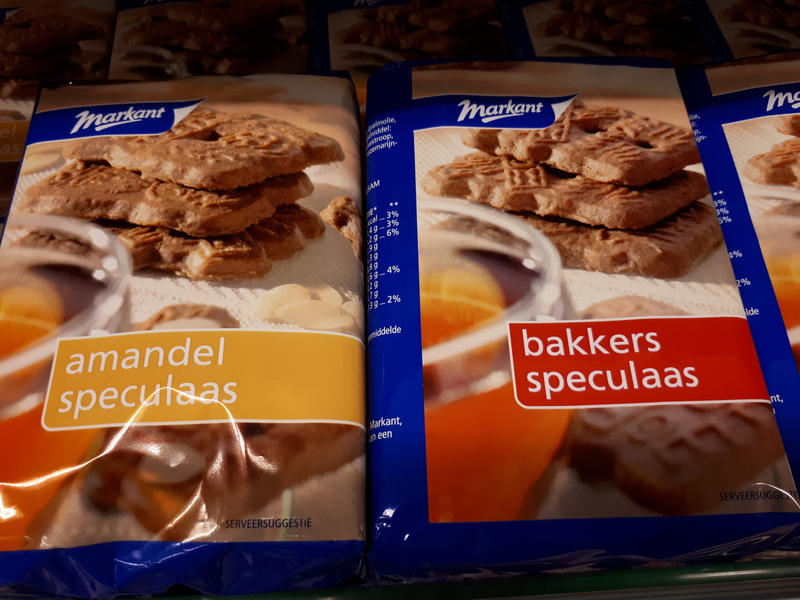 Speculaas biscuits. These are spiced shortcrust biscuits. They always have an image such as a windmill or figure (often from the traditional stories about St. Nicholas) on the front side. People tell me that they are supposed to be eaten at christmas time but I am quite happy to have them all year round. They are just perfect with a cup of tea. Croquettes. A croquette is a small breadcrumbed fried roll containing mashed potatoes or ground meat, cheese or vegetables mixed with brown sauce. The best time to eat one (or two) is while exploring the streets of Amsterdam, at Keukenhof among the tulips, at a street festival or on a canal cruise. Croquettes go well with a serving of friet (french fries) and mayonnaise. You aren’t going to win healthy eating awards for this fast food combo but go ahead and try it. You won’t regret it. Cheese. 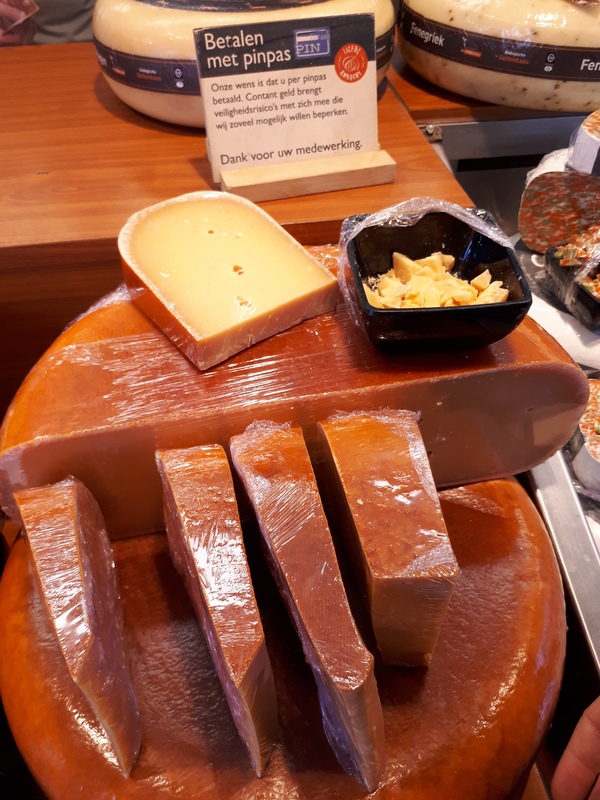 Dutch people eat a lot of cheese and I can understand why. It is simply delicious! Every Saturday morning we buy cheese at the Haarlem Market on the Grote Markt Square. We try out a different flavour every week. The supermarkets also stock a fantastic cheese selection. At the moment the Boerenkaas is my favourite. Just over a month ago I boarded a flight to The Netherlands. The land of cheese, tulips, windmills and bicycles was my new home. I left South Africa on a hot and humid day in March (not unusual for South Africa) and arrived in a cloudy and rainy Amsterdam (also not uncharacteristic for this part of the world). While I was pushing our trolley of suitcases through the airport and going through customs I wondered if I had lost my mind. I’ve done some strange things in my life but moving about 10 000km to another hemisphere probably tops the list of crazy stuff I’ve done. But actually, this move is one of the most responsible things I’ve ever done. It wasn’t an impulsive move but a decision to seek a lifestyle that’s a better fit for my family and I. We were ready for new adventures and unfamiliar places. We were ready to feel alive again and have fun. Now I’m enjoying establishing new rituals. Early morning bicycle commuting through the mist. That fresh smell of cold morning air. Coffee in the medieval part of town. Cycling along canals and rivers is becoming routine. 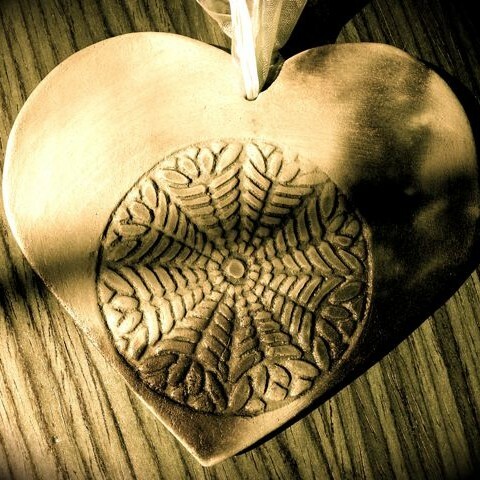 The temporary discomfort of new surroundings is also good for the soul. Being confused about how things work – this is an opportunity to talk to someone and make new friends. 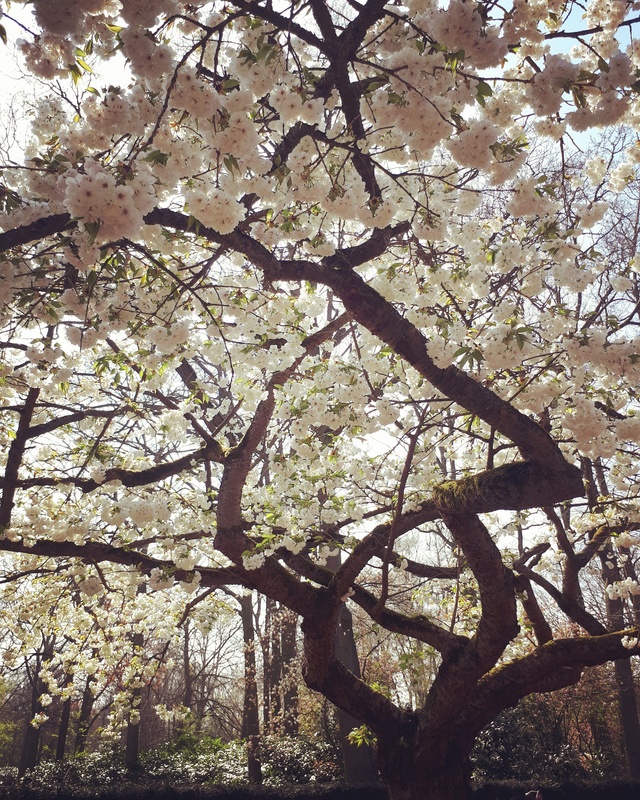 Getting lost – as frustrating as it is this is when I’ve discovered the most beautiful spots. De Bolwerken Park trees. This was the first photo I took when I arrived in the Netherlands. I was drawn to these magnificent trees from day one. People moor their boats along the canal that runs through De Bolwerken Park. My bicycle Petunia. This picture was taken before adding a saddle bag and a basket. Spaarndam. A village near Haarlem. These things make me feel vibrant and alive again. 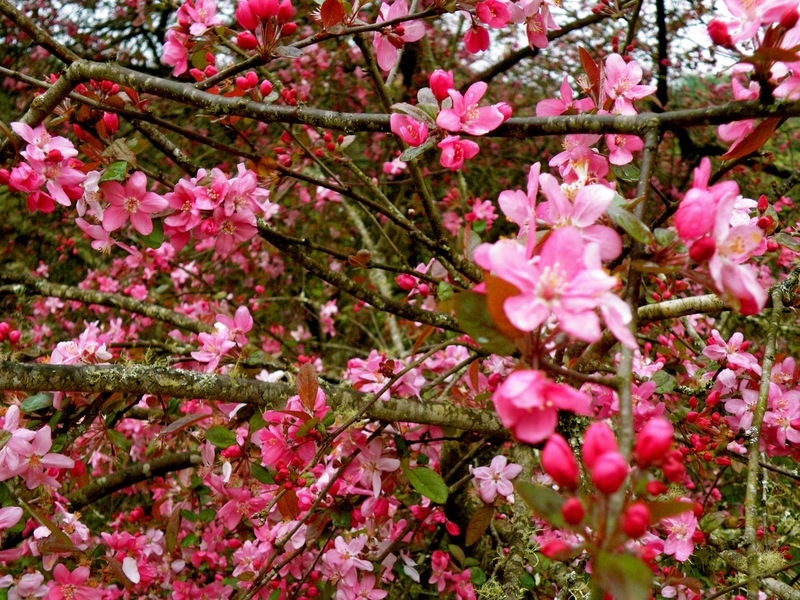 Happy Spring Day! My beautiful friend Robyn sent this thought to me this morning (my friends are going to stop telling me/sending me stuff…a lot of it ends up on my blog!). By Ernest Hemingway, reminding you to indulge in the start of the season with those who make you truly happy. Or else with nobody at all.